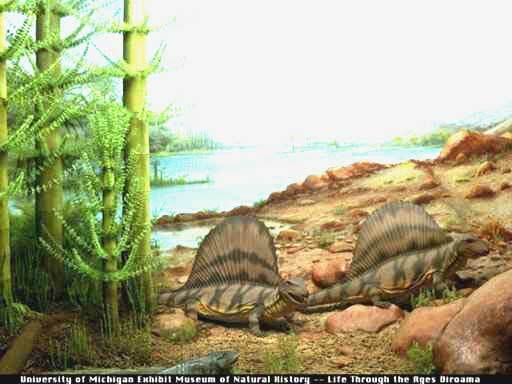 two large finback pelycosaurs of the genus Dimetrodon sun themselves on a river bank. To the left is a stand of Calamite trees. The Permian period was named in 1841 by the geologist Murchison after a tour of Imperial Russia to include the "vast series of beds of marls, schists, limestones, sandstones, and conglomerates" that overlay the Carboniferous formations in the eastern part of thecountry. He named it after the ancient kingdom of Permia and the present city of Perm near the Ural mountains. During the Permian all the world's land masses joined together into a single supercontinent, Pangea. The collision between Laurasia and Siberia-Kazakhstania and China finalized assembly of Pangaea by end of Permian. This was the first time since the late Proterozoic supercontinent of Rodinia that such a landmass had formed. Pangea was shaped sort of like a giant "Pacman", with the mouth on the east. There was a correspondingly large single ocean, called Panthalassa. The body of water enclosed by the pacman mouth constituted a smaller sea, the Tethys, which covered much of what is now southern and central Europe. Throughout the Permian, Europe was covered by a very salty inland sea, the Zechstein sea, which advanced and receded at least twice. This was home to an impoverished fauna, mainly brachiopods and bivalves, which were able to cope with the hypersaline conditions. There were at least two major extinction events, one in the middle of the period, and a better known one at the end. Various explanations have been offered, from the mundane, such as continental shelf environments being reduced, to the reasonable (Greenhouse events and superanoxia), to the imaginative (Superplume activity in the Earth's mantle) and the extreme (Strangelove Ocean); although it may have been a combination of all these factors and more as well. Unlike most other geological periods which have a three-part division into early, middle, and late, the Permian Period was conventionally divided into early and late only. The more recent arrangement has a three-fold division. Although the earlier part is well documented, there have recently been some controversies regarding the relative dating of the late Permian, and of the Permian-Triassic boundary in general. The following table presents the various periods, epochs, and ages, along with a drawing of a representative animal from that time. The dating (in millions of years ago) is of course approximate, as are all such ancient dates. We have used the most recent ICS dates, which quite plausibly allow rather more time to the later Permian ages then some of the earlier timescales. As the Permian opened, the Earth was still in the grip of an ice age, so the polar regions were covered with deep layers of ice. Glaciers continued to cover much of Gondwanaland, as they had during the late Carboniferous . At the same time the tropics were covered in swampy forests. Towards the middle of the period the climate became warmer and milder, the glaciers receded, and the continental interiors became drier. Much of the interior of Pangea was probably arid, with great seasonal fluctuations (wet and dry seasons), because of the lack of the moderating effect of nearby bodies of water. This drying tendency continued through to the late Permian, along with alternating warming and cooling periods. The Permian has few sites with exceptional preservation. Some exceptional arthropod specimens are known from Kansas and Oklahoma south-central US). The Permian is best known for its vertebrate fossils . Three important areas for Permian vertebrate fossils are the Early to middle Permian equatorial Red Beds of Texas and Oklahoma, the middle to late Permian Kazanian and Tatarian zones on the Russian platform (not shown on this map, but it is just north of the paleoequator, on the north-east of the large continent (near the lakes), and the Late Permian Karoo series (Lower Beaufort) of southern Africa (bottom center of map). The Red Beds are full of the fossil remains of Pelycosaurs like the finbacks like Dimetrodon, which was clearly the dominant predator of these environments for some 20 million years. The Russian and South African sites contain the remains of many therapsids. These creatures succeeded the basal synapsids as the rulers of the land, until they in turn were supplanted by the Archosaurs during the Early Triassic. 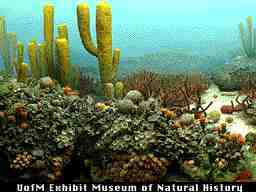 The warm shallow oceans swarmed with many kinds of life, basically very similar to Carboniferous forms (see left). Sedentary organisms like stromatolites, algae, foraminifers, sponges (Heliospongea (yellow) shown here), corals, bryozoa, and brachiopods (including the spiny Edriosteges) shown here), built great reefs which in turn provided homes and shelter for active animals like ammonoids, nautiloids, gastropods and fish. Ammonoids differed from their Carboniferous predecessors in that they had far more complex suture lines, frequently with many-pointed lobes and rounded saddles. The giant Carboniferous insects continued for a while, before also disappearing during the Guadalupian. Meanwhile, important new groups of insects like beetles and flies, with more complex life cycles, emerged. An Early Permian landscape in Europe. The form in the right foreground is the seed fern Autunia (=Callipteris), and in the left background is a marattialean tree fern. The conifer in the right background is Walchia, while the herbaceous plants around the pond are sphenophytes. This community represents a seasonally dry savanna-like biome of the tropics. illustration © Sergei Naugolnykh, from the Paleographic Atlas Project. Text from the same site. Reproduced with permission. This was a period of transition. The early Permian saw the continuation of the Carboniferous biomes, with polar tundra regions and warm wet tropical swamp forests. But the drying climatic tendency during the mid Permian spelled death for the mighty swamp forests. Water loving plants like Lycopods and Sphenopsids were greatly reduced in size, becoming mere shrubs. The old tropical coal swamps (with their giant lycopods, calamites, and cordaitales) declined and disappeared with the drier and cooler climate, surviving only in China and in high latitudes of Pangaea. Plant life consisted mainly of ferns and seed-ferns, with new plants like conifers and ginkgos coming into prominence. The Glossopteris flora predominating in Gondwanaland (the southern portion of Pangaea). It is gradually replaced by the seed-fern Dicroidium as the climate dries in the Late Permian.